Look at the list of chapters. I clean my tongue twice a day. Don’t you? Probably not. Only because you’ve never heard of that and are wondering why anybody would bother. Here I am, with my two essentials morning and night. He was Dr. Gupta, a dentist from India. I’ve forgotten his first name. My guess was he was in his 30’s. Was now a staff dentist at Worcester City Hospital. Which was one of my PR clients. I’m sure that’s how he heard of me. Yes, I was in the PR business at that time. Had my own PR office with a small staff — John Guy LaPlante Associates at 5 State St., Worcester. How come…me a journalist doing PR? Journalism and PR dovetail. That may surprise you. Journalists often deal with PR people because these folks want to promote, influence, change, launch something. So, truth is, many news stories often are ignited by a PR spark. And PR people count on scoring with journalists because that’s how they earn their paycheck. I became familiar with PR people when I was a reporter and then a feature writer at The Worcester Telegram-Gazette and more so when I became editor of Feature Parade Magazine in the Worcester Sunday Telegram. They’d come in and pitch a story idea to me. Sometimes I’d day Yes. Sometimes No. Sometimes Let Me Think About It. There was a disturbing policy change about Feature Parade and I left to become PR director at Assumption College there, my alma mater. My job was to promote Assumption within its own constituency….alumni, benefactors, staff, even students. And with the outside world. Through news releases to the media and mouth to mouth through personal contacts– preaching Assumption to the media and to people who might be able to help Assumption. A tongue cleaner? He showed it to me. It was made of wood, finely sculpted. It looked like a disposable plastic safety razor. That shape and just a hair bigger but no blade. Well, yes, but plastic. “Cleaning your tongue is important for good oral health. It’s So important that many people around the world clean their tongue — people who never brush their teeth because they never heard of that. People in India, my country. I’m sure you did not know this. “I saw the need when I was in dental school, yes, back home. And I began thinking about that. And this is the result.” He said it proudly, waving his little invention t and putting it in my hand. He mentioned the huge marketing possibilities. He told me every person who brushes should also scrape. Especially heavy smokers. Chew tobacco. Or people who take many medications. Eat spicy foods. In fact, he said cleaning the tongue is good for the teeth and the whole mouth. It removes bacteria. Lots of bacteria in the mouth. It rids the mouth of lingering things, little left-overs too small to notice, that are not good for your teeth. It cleans the breath, and so many people have bad breath. It’s nicer for kissing. It makes you feel better. I had just remembered the Hula Hoop, brand new back then. Just a toy. Do you remember the Hula Hoop and how it became sensational? A hot item for millions of people, kids and athletic adults. They would wear it low slung, just above their hips, and begin swiveling and gyrating. And the hoop would swirl around and swirl around and faster and faster. Or around an arm, or a leg. Fun. Good exercise. There were Hula Hoop contests. Millions were being sold. In fact, I just checked and Hula Hoops are still a big seller. For sure, whoever called it the Hula Hoop was a genius. Instantly I recognized the potential for Dr. Gupta’s tongue cleaner was enormous. Every owner of a toothbrush could become a buyer. Maybe it could become another Hula Hoop! Five were business men. The other was my dentist, Dr. Clifford Audette. My age and a good friend. But dentistry is not only a profession. It’s also a business. True of the whole of medical practice, of course. The meeting was on a weekday at 4 p.m. I figured close to the end of the business day would work best. They sat around the conference table in my office. I took the floor. Dr. Gupta was not invited but I had his prototype to show. I showed the tongue cleaner. Stuck out my tongue and showed how to use it. Passed it around. Talked about Dr. Gupta and his need to get things going. Talked about its benefits. Everything Dr. Gupta had explained to me. Talked about universal tongue cleaning among peoples in far-off countries. Who didn’t brush their teeth because they had never heard of it. Mentioned the huge market in the U.S. Of course, talked about the sensational Hula Hoop. Then I said. “I’m sure you see the potential. The huge market—each and every person, from age 3 up. Do you see how cleaning your tongue might truly be important? I invited you because you’re all interested in new opportunities. You’d be getting in on the ground floor! They asked questions, of course. But not many. They saw there wasn’t much to ask. If interested, at another another meeting the details could be discussed.. The meeting broke up. I had no idea whether the idea would fly. Only one called back. Dr. Audette. “John, I’d like to meet Dr. Gupta,” he said. “Cliff, I will arrange that.” I called Dr. Gupta, told him the big news, and invited him to a meeting with Dr. Audette and me in my office. That happened. Dr. Audette held the prototype in his hand, studied it, chatted with Dr. Gupta, asked questions, and sized him up. They both left. The two conferred again, worked out a deal, and Dr. Audette got an exclusive to promote and market the cleaner. Dr. Gupta was pleased. I was pleased. I sent Dr. Gupta a bill. It was modest. I don’t remember how much. He was a new immigrant. He had meager means. I myself had no interest. I had my hands full running my own business plus a sideline I had started in investment real estate..
Dr. Audette was enthusiastic. He refined the shape a bit. It would be made of plastic, of course. Instead of one “blade,” it would have two, in fact, eventually three. He worked with a plastics company. He had samples made. He gave them to patients to try. He gave me one. I began using it. I asked for an extra for my daughter, Monique. We all started cleaning our tongues. My mouth was quite clean. I noticed only my ordinary spittle. But I did feel better for the effort. I took Dr. Gupta’s word that scraping could indeed be healthful and therapeutic. Well, the tongue cleaner did become a big idea. Dr. Audette hired a lawyer and had it patented. He made a study of some patients’ mouths before they started scraping and three months later, then six months later. Most people liked scraping. Some definitely had a cleaner mouth. Some hardly noticeable. He launched a marketing effort, had cases of tongue cleaners made—spent a ton of money. He advertised… promoted especially to nursing homes. So many patients have foul mouths because of all the meds they’re on. Got a good response. Well, the tongue cleaner never became another Hula-Hoop. But he sold thousands of them. Slowly the idea took hold. Then know what? Some people in the tooth brush business paid attention and developed tongue cleaners of their own. Today in the toothbrush-toothpaste area of store after stores you will see tongue cleaners for sale. I collected them for a while. Had one with a scraper at one end and a brush at the other. Dr. Gupta was pleased but disappointed, of course, it didn’t become universal. He may still be practicing dentistry. I lost track. I did hear that he worked at developing the market for it back in India. I have no idea how that has worked out. My friend Cliff died two years ago. He was a successful dentist with many patients and friends. At his wake, his son Chuck slipped a tongue cleaner into his dad’s breast pocket. That gesture spoke volumes. 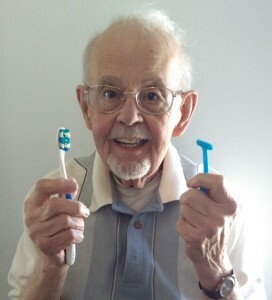 His obituary spoke of him as the inventor of the tongue cleaner. I hope Dr. Gupta didn’t hear of that, wherever he is. Cliff was its very earnest developer. I haven’t thought of this in a long time. Curious as always, I looked up tongue cleaners at www.amazon.com and www.walmart.com. Amazing how many shapes and styles they now come in. And the range of prices! Well, as I said, I clean my tongue twice a day, every day. Sometimes I think it’s unnecessary. But maybe that’s because my mouth is so clean as the result of my daily efforts. But maybe I do it also because deep-down I feel I god-fathered the idea. Why don’t you try one? It’s cheap and easy and what’s to be lost? Hey, experiment tonight with a teaspoon turned upside down.